The majority of hand-knotted rugs today are made in Persia (Iran), India, Pakistan, Nepal, Afghanistan, and Turkey. 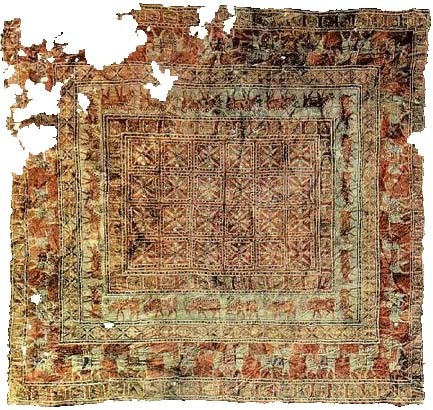 The oldest extant Oriental carpet is the Pazyryk carpet which was found frozen in a Scythian tomb in the Altai Mountains of Siberia, and dates to 500BC. The level of artistry in the Pazyryk tells us that knotted pile rugs were probably being woven for hundreds of years before this. The Pazyryk carpet currently resides in the Hermitage State Museum in Leningrad, Russia. Creating a hand-knotted rug is a complicated task, requiring a variety of distinct skills and techniques. The process is both labor intensive and time-consuming. First, raw wool is collected from the sheep, washed, carded, and spun into yarn. The yarns are then carefully dyed using either vegetable or chemical dyes. Once the yarns are spun and dyed, the loom is prepared for the weaving process. The vertical “warp” threads are tied between the loom’s upper and lower beams, and define the rug’s length. The horizontal “weft” threads are woven between the alternating warps across the rug, and define the rug’s width. This makes up the foundation of the rug. Tiny knots are tied onto the warp, creating pattern and design. The weft threads anchor and align the rows of knots. When the knots are later cut, they stand away from the warp/weft to create the velvety pile of the finished piece. The knot count is a measurement of the density of the knots that make up a rug’s pile. Although rugs with high knot counts are usually considered higher in quality, this rule is not absolute. There are other significant factors that will also affect the overall quality and aesthetic appeal of a particular rug. These include the quality of the wool, the skill with which a given design has been executed, the balance and subtlety of the color palette, and various finishing details. The Persian knot fully wraps around one warp thread and opens around the second. Turkish knots are double knots and the knot fully wraps around two warp threads. The Turkish knot and Persian Knot are utilized in all weaving countries, not just specifically Turkey or Persia (Iran). Due to the process, it is more difficult to weave a fine quality rug using Turkish knots. Neither one of these methods are superior or inferior to the other. Knot density is by no means the sole criterion of quality. Turkish or Ghiordes knots are symmetric. This example shows four Turkish Tuknots. 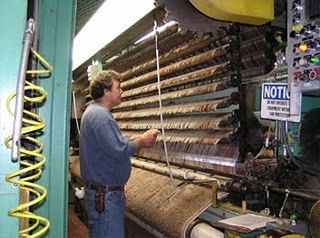 Machine made rugs are made on large mechanical looms. 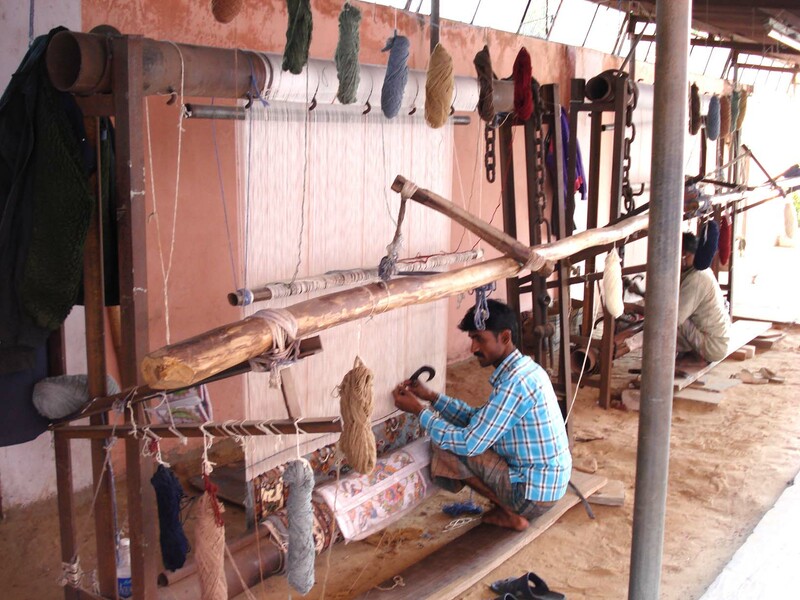 The loom is strung with a jute warp, and then woven using nylon, polypropylene, wool or other material. Computer operated machines produce a number of styles in various sizes from a predetermined set of colors. More than 40 shades can be achieved in a single area rug although they commonly have 6-12 colors. In recent years, continuing advances in technology and product innovation have greatly expanded the fashion and quality range of this category. Braided rugs are constructed in several different ways, including tape, tubular, yarn and flat. In the tradition of early America from which braided rugs were created, these rugs may be woven with many different materials such as wool, clothing, old blankets, nylon and blends. Flat weaves are constructed without a pile and are usually reversible. Colored weft yarns are woven through the warps to create pattern. These rugs are usually made of wool, cotton, bamboo, or nylon. This category includes Kilims, Dhurries, Soumaks and Needlepoints. A needlepoint is a flat weave that is created by weaving colored yarns through a pre-made scrim, or grid-like backing. Hand-Tufted and Hand-Hooked rugs are produced in much the same way. 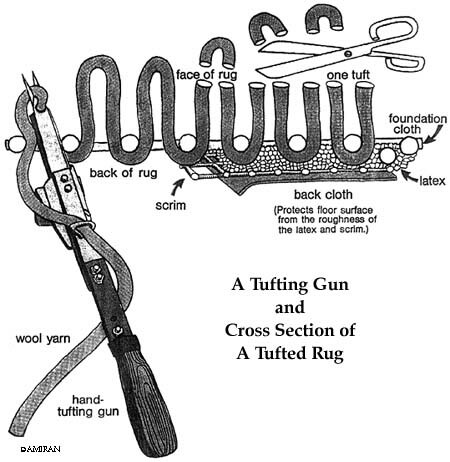 A tufting gun that works much like an oversize sewing needle is used to push and pull threads of yarn through a scrim—a pre-woven grid foundation. With a hooked rug, the loops of yarn are left intact to form a characteristically “knobby” pile. In a tufted rug, the tops of the loops are sheared to expose the tread ends for a softer and plusher pile. A natural latex adhesive is applied to the back of the rug to secure the wool loops and the back is covered with canvas for finishing. The manufacturing time of a hand-tufted and hand-hooked rug is shorter than that of a hand-knotted rug, yet these rugs are still handmade works of art. Wool shorn from sheep is completely natural. It is composed entirely of amino acids, which are the building blocks of life. Noted for its inherent ability to resist stains and retain appearance, wool is the most commonly used fiber found in handmade rugs. It is completely renewable (sheep can be shorn every 9 to 12 months). Wool is extremely durable and easy to maintain. It is also biodegradable. In soil, wool readily biodegrades to produce nitrogen, sulfur, carbon dioxide and water, which are all plant nutrients. Wool is also naturally flame retardant. A natural fiber processed from silk worm cocoons, silk is often used to accent rug designs. It is a delicate fiber that has a luminous natural sheen and takes color beautifully. Petroleum based products, derived from propylene and ethylene gasses. The polypropylene fiber is characterized by its resistance to moisture. It is strong, abrasion resistant, quick drying, colorfast, mildew resistant and sometimes soil and stain resistant. Its fibers have the lowest density of all manufactured fibers giving olefin a very lightweight quality. A durable, petroleum based synthetic fiber that has good dying characteristics. Either present as a synthetic fiber typically made from viscose/rayon, or a natural fiber using mercerized cotton (man-made silk). Also called ‘faux silk’, viscose is sometimes used as small accents or in a short, dense pile construction to add a shimmering effect. Sisal, jute and hemp rugs are woven from natural plant fibers. They are strong and durable, but not recommended for use in areas with high humidity and moisture.